If you are looking for an individual and exclusive wedding gift then this cute pair of robots in love are just the thing. This personalised wedding print will brighten up the home of a newly married couple and be a constant reminder of their special day. The design shows a blue boy robot with a top hat and bow tie and a pink girl robot with a tiara, veil and bouquet. Colourful confetti, shaped liked nuts and bolts, floats above their heads contrasting beautifully upon the vibrant blue background. Personalised with the couple’s names, surname, wedding date and the town or city where they were married. The print is available in A4 unframed, A4 framed and A3 unframed. Enter the two names you would like on this print. Name 1 will be printed above the blue robot and name 2 above the pink robot. 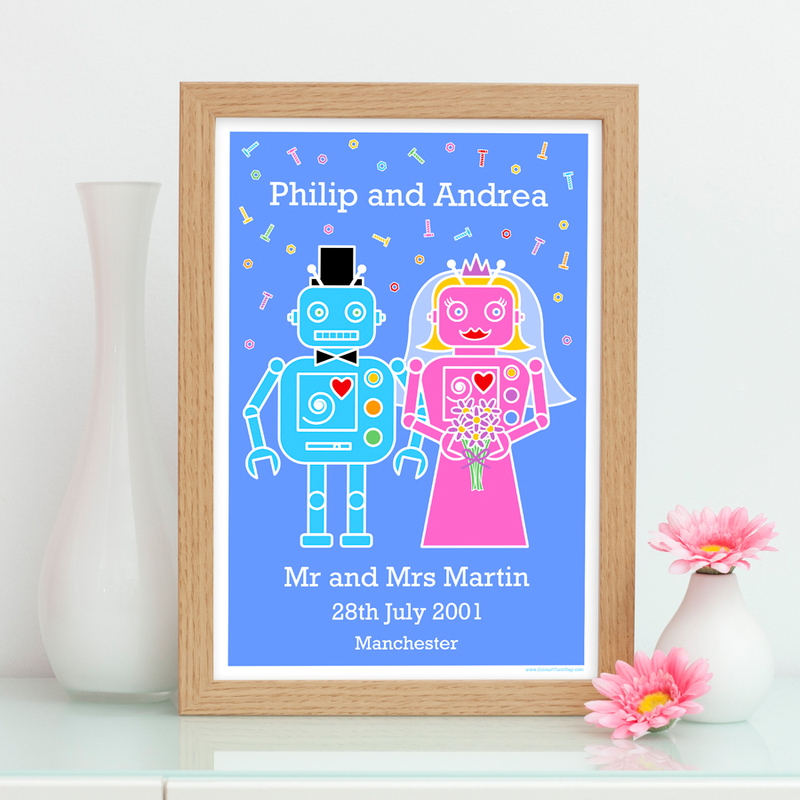 Be the first to review “Robots In Love Personalised A4 / A3 Wedding Print” Click here to cancel reply.